The 8000 series digital multimeters represent another breakthrough in measurement technology, leaping ahead of older multimeter designs using the latest in components and multi processor digital design. The heart of any precision instrument is its analogue design, and with the experience and knowledge gained by Transmille since 1997 with the design of multiproduct calibrators all of this knowledge has been implemented in the 8000 series. 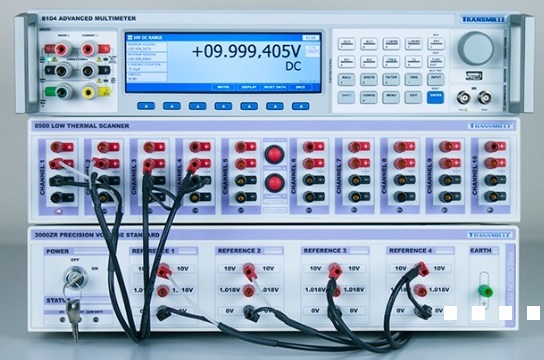 By bringing together the latest technology in both analogue and digital design, Transmille have significantly reduced the parts count and complexity of precision multimeters, achieving unrivalled performance and functionality at a breakthrough price/performance ratio to meet the requirements of modern day laboratories. The 8000 series digital multimeter represent another breakthrough in measurement technology, leaping ahead of older multimeter design using the latest in components and multi processor digital design. Dynamic display of accuracy, measurement uncertainty, standard deviation and more provide metrologists with immediate feedback of their measurement and enable users to maximise performance while improving confidence in measurements. The 8100 Series has been optimised for use with Transmille’s range of AC/ DC current shunts enabling DC and offset parameters to be entered in providing direct measurement of applied current on the screen. The 8100 simultaneously measures the voltage and frequency and performs a real time correction based upon the AC/DC difference at the current frequency and the value of the shunt.The high input impedance of the 8100 series below 10V AC removes the requirement for buffer amplifiers minimising sources of errors and simplifying connections.